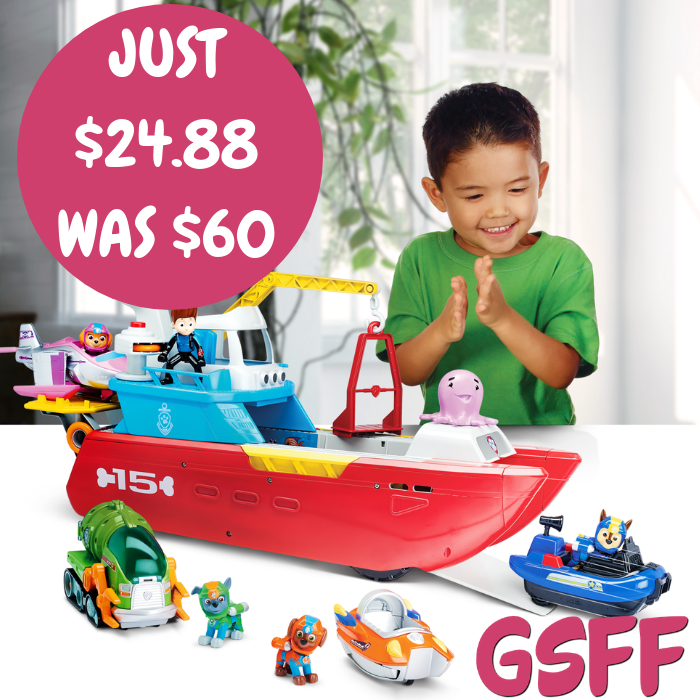 PAW Patrol Sea Patrol Just $24.88! Down From $60! Shipped! You are here: Home / Great Deals / Amazon Deals / PAW Patrol Sea Patrol Just $24.88! Down From $60! Shipped! Amazon is now offering this PAW Patrol Sea Patrol for just $24.88 down from $59.99 PLUS FREE shipping! When you’re rolling with the Paw Patrol, you never know if adventure will strike on sea or land – so be ready for both with the Sea Patroller! This ship is ready to sail across Adventure Bay and any other imaginary ocean, but cannot be submerged in a bathtub, sink or pool. This hardy vessel transforms from ship to land vehicle in one smooth motion. Slide the bridge forward and wheels drop down, taking you from the high seas to the open road. With the bridge now located at the front of the vehicle, you and Ryder can steer straight to adventure. RESCUE READY: Lift Ryder out of sticky situations with the moveable crane & attachable cage, send him down the ramp with his Rescue ATV, use flashing lights & sounds to keep Adventure Beach safe, & the lifesaver launcher to rescue anyone in distress!